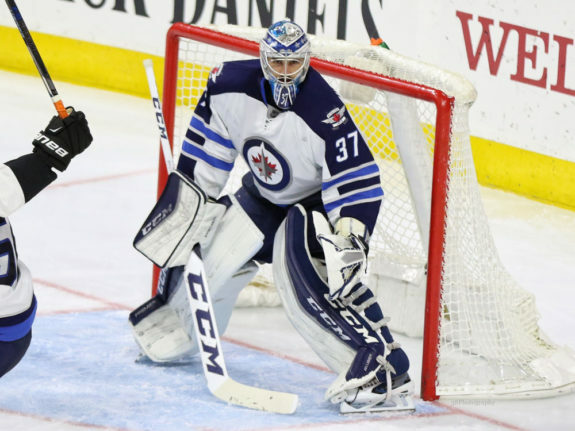 Winnipeg Jets goaltender Connor Hellebuyck closed out 2018 by capturing a milestone, recording his 100th-career regular-season win in a 4-3 New Year’s Eve victory over the Edmonton Oilers. Hellebuyck has turned in many excellent performances for the Jets throughout his four seasons in the crease. In recognition of him reaching triple digits in the win column, here are five of his most memorable games thus far. Note: playoff games are not included in this list. The Jets and the St. Louis Blues entered this mid-February Central Division clash trending in opposite directions. The Jets had won three of their last four, while the Blues were on a four-game losing streak. Hellebuyck made sure his opponent kept singing the blues, stopping all 34 shots he faced in a 4-0 victory. Blake Wheeler and Kyle Connor led the charge with a pair of points each. The trends for each team continued after Hellebuyck’s sixth shutout of the season. The Jets went on to win five of their next six games and continued to pull away from the Central Division pack while the Blues lost two more and the seven-game skid quashed their playoff chances. In that span, the case for a Vezina Trophy nomination for Hellebuyck grew ever-stronger. Sometimes teams need their goalie to bail them out early when they start without much steam. Hellebuyck did just that in a Sunday matinee against the Philadelphia Flyers. The Jets came out flat, were outshot 10-1 early and should have been down a goal or two through the first period. However, Hellebuyck was ready to play, making a number of athletic saves, including some outstanding ones as the Flyers were buzzing on a power play. His play, which was just returning to form after a rough patch, sparked the Jets, who found their stride and ended up romping their way to a 7-1 win. While the lopsided score obscured how integral Hellebuyck’s 36-save performance was, his teammates gave him plenty of props after the game. “Helly made a lot of big saves to keep us in it,” Tyler Myers said. “When they had their push, Helly made some big saves, some huge saves actually, and kept us right there,” Josh Morrissey added. “He looks the way that we’re used to seeing,” Paul Maurice said. After posting back-to-back wins against the Minnesota Wild and Toronto Maple Leafs in his first two NHL starts, the Jets gave their then-rookie netminder the toughest assignment of his fledgling career: to neutralize Alexander Ovechkin, Niklas Backstrom and the high-octane Washington Capitals, who’d only lost five times in regulation. Hellebuyck passed the test with flying colours. 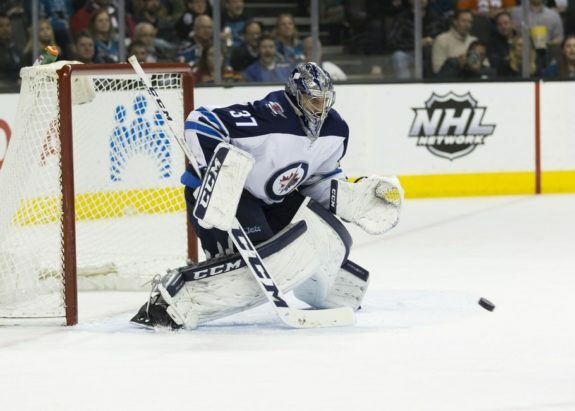 He continued to impress Jets’ brass by remaining undefeated and making 37 saves in a 2-1 overtime victory. His best stop occurred in the extra frame when he stretched out his stick to rob T.J. Oshie of what looked like the sure game-winner. The save provided Mark Schiefele the opportunity to play hero at the other end less than a minute later when he ripped home a shot from the dot. The Jets had reached the nadir of their suffering by the time they returned to the then-MTS Centre for this late-November game against the Nashville Predators. They were coming off an 0-5 road trip in which they were outscored 20-6. Two days prior in Music City, the last game of the swing, the Predators victimized Hellebuyck for five goals on 30 shots. 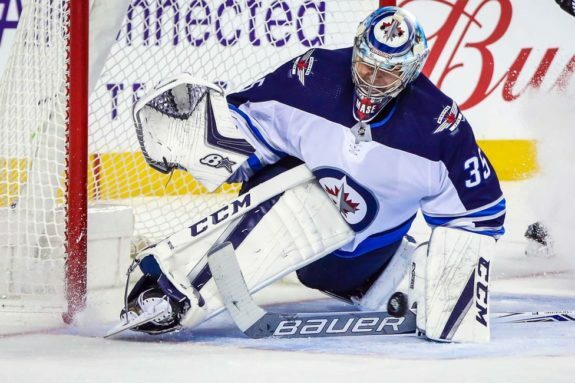 The Jets desperately needed a win and Hellebuyck made sure they got one. The then-sophomore, whose love for and ability to thrive in afternoon games is now well-documented, faced cannonade but bested all comers and managed to make Drew Stafford’s first-period goal stand as the game-winner. His performance was so good that it led to some to joke he should receive all three stars, like Maurice Richard did in 1944. “We just needed to get back to our game and that’s what we did tonight,” the modest goaltender said after the game despite his team being outshot 42-24. If there was ever an early game bearing more importance than the Jets’ third game of the 2017-18 campaign — a matchup against the Edmonton Oilers — it’d take a lot of searching to find. The Jets sputtered into Alberta’s capital after a pair of disheartening defeats to begin the season. They were thwacked 7-2 by the Maple Leafs in their home opener and thumped 6-3 by the Calgary Flames in their first road game, two match ups in which newly-minted starting goaltender Steve Mason struggled mightily. 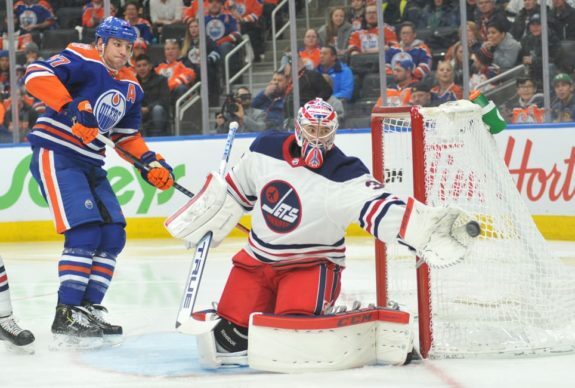 “He put on a goaltending clinic at Rogers Place, blocking 37 shots, including 21 in the first period, as the Jets weathered an early storm, crafted a lead and — this time — didn’t crumble,” wrote the Winnipeg Free Press’ Jason Bell (from ‘Doff Your Hat to Ehlers, Jets Fans‘ – Winnipeg Free Press – 10/9/17). 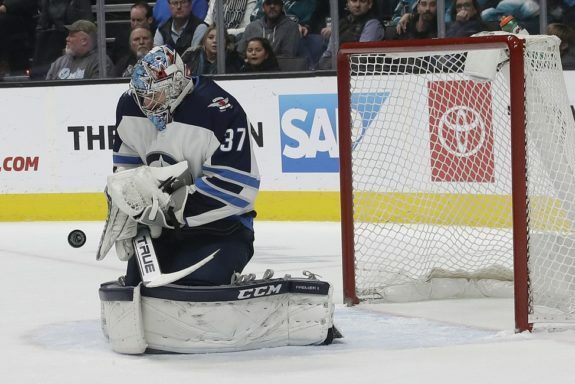 The win was the beginning of a tidal shift for both Hellebuyck and his team. He won his next three starts, stole and never relinquished the crease from Mason. The rest – his outstanding, 44-win campaign, Vezina Trophy nomination and rise to elite goaltender status — is history. It all stems from this single start. Do you agree with the list? What other performances from Hellebuyck got you out of your seat? Leave a comment!